The fuel cell darling has delivered impressive revenue growth in the first half of 2018. When will that start piling up on the bottom line? 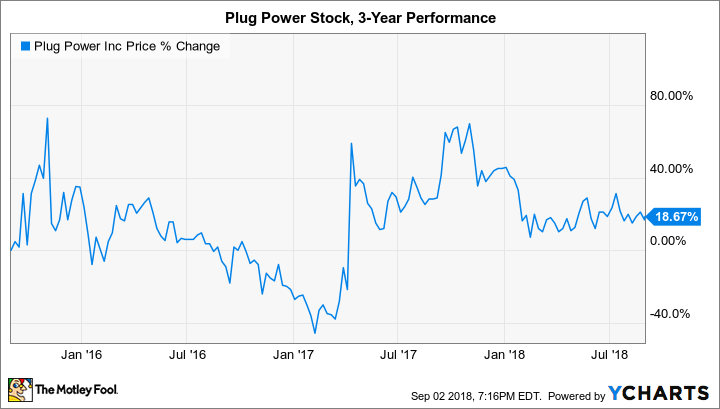 On the surface, it appears that hydrogen fuel cell pioneer Plug Power (NASDAQ:PLUG) is cruising through 2018. New supply and customer agreements seem to be paying off, as demonstrated by a record $63.2 million in net revenue generated through the first six months of the year. That's a 76% leap from the same period of 2017. However, investors will also notice that the significant revenue growth is doing almost nothing to increase profitability. The fuel cell manufacturer reported an operating loss of nearly $44 million in the first half of 2018, compared to an operating loss of $48 million in the year-ago period. Some investors might argue that new partnerships and innovative new fuel cell stacks will take time to make their presence felt on the bottom line. Others might question if Plug Power will ever turn a profit. Turns out, there are some answers in the company's financial statements. Plug Power has kept the lights on by powering forklifts for major warehouse owners such as Walmart and Amazon.com, which also own a significant number of warrants issued by the fuel cell pioneer. The company is hoping to eventually move into on-road mobility applications, too, as confirmed by a recent demonstration of a fuel cell-powered delivery van operated by FedEx. Data source: Plug Power SEC filing. Plug Power isn't gaining much benefit from scaling its business. That is, growing revenue totals are simply being met with growing cost of revenue totals, which doesn't allow profits to accumulate. To better see why this is occurring, it helps to break down the business into more detail. The fuel cell pioneer generates revenue from several distinct activities, each of which has its own unique cost structure. The table above is telling for investors interested in Plug Power. The company appears to be capturing a sustainable benefit from economies of scale when it comes to selling fuel cells and delivering fuel to customers. It may also be on the right track for providing maintenance services for the installed base of fuel cell infrastructure, although the quarter-to-quarter performance is choppier than indicated above. Nonetheless, services will become increasingly important to the financial performance of the overall business as the installed base of fuel cells grows over time. That brings investors to power purchase agreements (PPAs). The company's PPAs offer customers simplicity through a product offering called GenKey, which combines fuel cells, maintenance services, and fuel deliveries into one monthly lease payment. These include the agreements with Walmart and Amazon.com -- and it appears the large companies are throwing their weight around to wrest out favorable prices in exchange for trying out unproven technology. It's not going so well for Plug Power. Consider that in the first half of 2018 the business recorded a gross loss of $6.6 million on PPAs and a total gross loss of $6.3 million. That means Plug Power would have squeaked out a gross profit if not for maintaining its unwieldy relationships with its largest customers. Worse, the financial performance of PPAs is deteriorating as the number of customer sites using GenKey increases (29 at the end of June 2017, and 35 at the end of June 2018). Simply put, if PPAs didn't include the likes of Walmart and Amazon.com, then Plug Power probably wouldn't keep the lease program and its gross margin of negative 59% around. Considering the detrimental effects on the rest of the business, perhaps investors should begin questioning the value of the relationships as well. Plug Power and its faithful shareholders often like to cite the relationships with Walmart and Amazon as proof that the fuel cell technology platform is capable of providing value to customers with global scale. While that sounds great from a PR standpoint, digging deeper reveals that these relationships are significant and persistent obstacles to the business's ability to achieve profitability. The rest of the business could grow to cover up that blemish, but it will take considerable time (likely years) and effort -- if it's possible at all. Unfortunately, the business may be past the point of no return with these PPAs. Plug Power is financially tangled with Walmart and Amazon.com with warrants that would grant a combined 110.5 million in shares of common stock if executed. The company has just 214 million shares of common stock outstanding today. Simply put, the reasons the business isn't turning revenue growth into profitability, and the nature of the PPAs, should make it easy for investors to pass on this fuel cell stock.